Directions: Read the questions first. Use the online book Auroras! Mysterious Lights In The Sky to respond to the questions. Click on the link to begin the activity. Note: You must have Flash plugin installed to view the online book. 1. What are the two names for the mysterious lights in the night sky? 2. What causes the lights? 4. Write two synonyms for auroras. 5. When can you see an aurora? 6. If you lived in Australia, you would see: Northern lights or Southern lights? 7. What does the magnetosphere do? 8. Electrons make atoms of different elements glow in different colors. Name the two elements and the colors they glow. 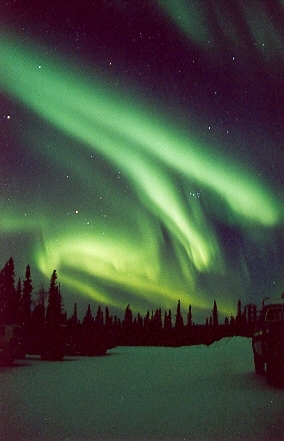 Alaskan students study the aurora. 10. Offline - Conduct a survey of your family or classmates. Have you ever seen an aurora? How many times? Where were they when they saw the aurora? Report your results in percentages. How to make a digital answer sheet: Highlight the text of the questions on this web page, copy them - Edit .. Copy. Open a text document or word processing document. Paste the questions into the blank document. Answer the questions in the word processing document in a contrasting color or font ( not yellow avoid fancy fonts like , Symbol, or . Save frequently as you work. I do not like losing my work. You will not like it either.